We spent over 48 hours researching and testing 14 different cat condos and found that number of levels, durability, and materials used in construction were most important. Go Pet Club Cat Condo scored high marks in all categories and is our top pick. 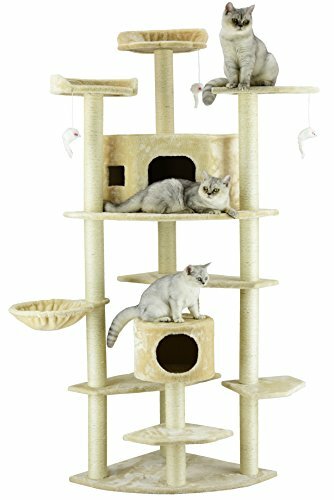 This fun cat condo has 13 different levels and 13 posts that provide plenty of play space and resting space for your cats. It is the perfect cat condo for homes with multiple cats. All of the posts are covered in natural sisal rope so the cats can use them as scratching posts. This condo measures 80” in height. Cat condos are very popular pieces of cat furniture with both cat owners and the cats themselves. They come in all shapes, configurations and sizes to fit any size home. Whether you have one cat or several, having one of these top rated cat condos is sure to make your cat or cats very happy. Cat condos give your cats the ability to climb, scratch, play and get away from young children and dogs as well. With all of the different styles available, it can be really difficult to choose one. That’s where we can help. We’ll tell you all about these top rated cat condos and also give you some detailed information on how to choose the right cat condo in our buyer’s guide. With this knowledge you will be able to narrow down your choices and choose the cat condo that will be perfect for yours and your cats’ needs so you’re not purchasing something you don’t need or something that doesn’t meet your preferences and needs. It’ll be hard to find a cat condo that your cats will love more than the Go Pet Club Cat Tree, 80” size. 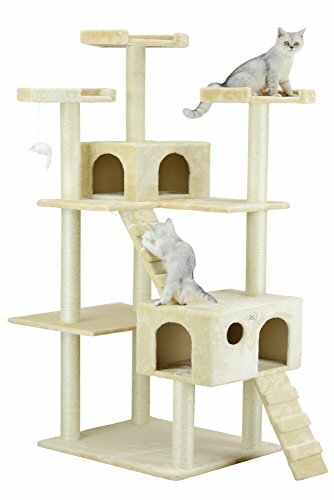 With an impressive 13 levels and 13 posts, 3 hanging toys, 1 hanging rope, a basket, a small house, a large house, and several perches, your cat will have plenty to keep themselves occupied. The posts are covered in sisal rope and the platforms, perches and houses are covered in soft faux fur, providing comfortable places for your cats to sleep, play, or just hang out and get away from the children or other pets for awhile. Assembly is easy, and the instructions and tools are conveniently provided for ease of use. The neutral beige color works well with most decors. The size of this cat condo is great for medium to large cats and has plenty of room for multiple cats. If you’re looking for the perfect piece of cat furniture for your cats, you’ll love this and your cats are sure to as well. The Armarkat Cat tree has plenty of room for multiple cats, but still works great even if you have just one. Your cat will have several levels and posts to sit, sleep and play on any time of day or night. Construction is pressed wood that is covered in a faux fleece covering that your cat will love. The light, neutral coloring will look great in any room you choose to have it in. Putting it together is super easy as well and the instructions and any tools you will need are included already. Cats love being high up most of the time, and this is a perfect solution that feeds that desire of theirs. It even has a toy hanging from a perch for them to swat at. The cat condo measures 57” high. 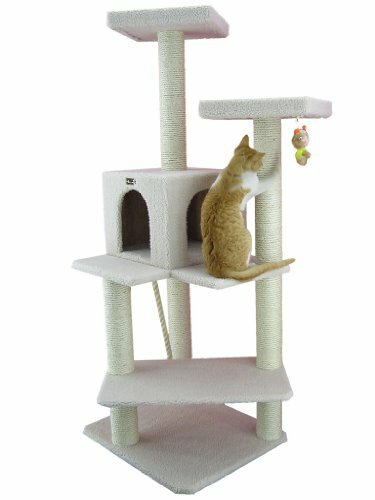 With 10 posts and 15 levels, your cat will be in condo heaven with the Go Pet Club Cat Tree. All of the posts are covered in natural sisal rope, making them the perfect cat scratching posts. Having places to get their natural scratching tendencies out protects your other furniture and door frames from their habits. The levels are covered in faux fur, making them comfortable for your cats to sit and lay on whenever they want a private spot to jut rest and hang out. It also has two “houses” if your cat prefers to be in an enclosed space like so many cats do. Measuring 50″W x 26″L x 72″H, this cat condo is plenty big enough for multiple cat homes so everyone has a spot of their own. There are even a few toys hung up for the cat to play with. Climbing from one level to another is simple thanks to the easy to walk on ramps that lead from one level to another. If your cat likes to be “king of the mountain” he or she will love the tall top levels where they can sit and survey their surroundings. This is the perfect place for your cats or cat to enjoy themselves and call their own. The neutral beige color goes well with most décor so you can put it in any room in the house without it looking bad. Your cats will love this cat condo and you will enjoy watching them play. Assembly is easy and step by step instructions and tools are included for your convenience. If you have cats, you already know how much they love to climb, scratch and in general be up high. Any one of these top rated cat condos will more than fit the bill for your cats. They provide privacy, activities, and places for your cat to just enjoy being a cat. These cat condos are all neutrally decorated with beiges, whites and other neutral colors so they fit in well with most home décor. It’s important to give cats an outlet for their scratching and to provide them with opportunities to do what their natural instincts are which is lots of climbing and jumping. If you have children or dogs, your cat will really appreciate having a place that is just theirs that they can use to get away from their other “roommates”. Read below to learn even more about these great pieces of cat furniture so you can get the tips and information on how to choose just the right cat condo for your pet. Although it may sound like an apartment for cats, a cat condo or cat tree as they are also called, are play places for your cat that include scratching posts, ramps, perches and little “house like” boxes. They can be relatively short or as tall as 80” or taller. These cat paradises can be really elaborate with multiple levels and activities and can accommodate multiple cats at once. With cats naturally loving climbing, scratching and jumping, these pieces of furniture provide a lot of stimulation that they don’t always get as indoor pets. It also gives them the chance to get away from other members of the family such as small children that love to tug on ears or tails and dogs. Cat condos are typically made of pressed wood of some kind, covered by faux fur. Plywood is much better than press board and lasts longer as well. While some manufacturers may make cat condos out of more expensive, solid wood, remember that this will increase the price substantially. Benefits to solid wood cat condos is that you can plan on having it around for a LONG time, especially if it is put together with the right kind of fasteners. The posts that are a part of these structures are generally covered in sisal rope which is a type of material that cats are naturally drawn to. It is the perfect material for scratching, one of cats’ favorite activities. By providing them an outlet for this behavior, you will more than likely save your other furniture and door frames as well. Although cat condos used to be covered in carpeting, the loop pile that was used tended to wear out, fray and get caught on their claws. The faux fur that is used now by almost every manufacturer is soft and will not have those same issues which mean that it will last much longer than the carpet covered condos did. The weight load of your cat condo is an important factor as well. These pieces of furniture can weigh anywhere from 5 to 200 pounds depending on the materials used. The sturdier your cat condo is, the more use it will get. A cat isn’t going to want to be on a shaky cat condo or one that tips over. Some models are free standing and others are floor to ceiling models that are actually attached to the ceiling by some means. Whatever you choose, make sure that it can safely and securely handle the weight of all the cats that will be using it at once. It will ensure that your cats continue to use it without fear and you won’t have to worry about it toppling over onto someone. Another important note about materials used in the construction of your cat condo is how it is put together. Condos that are put together with screws will be much sturdier and long lasting than those that are put together with glue only or nails. Look for the cat condos that use screws if you want one that is going to be around for years. There are several factors you need to consider when it comes to buying the right cat condo. Before you start shopping make sure you have the answers to these questions so you get one that will work well for you and your cat family. How many cats/kittens do you own? – If you only have one cat or kitten, getting an 80” cat condo is overdoing it a bit. However if you own several cats and kittens, having a large cat condo may be the best thing you’ve ever done for them. Match the size cat condo you purchase to the number of cats you have so there will be room for them to relax, play and enjoy themselves. Where will you be putting the cat condo – Cats like to be in the center of the action, so be sure that you put your cat condo in a room that has people in it regularly such as the living room or den near the sofa or TV. Located in a busy room will ensure that the cat condo gets a lot of activity and use. Another great place is in front of a window that gets morning sun. Cats love to sun themselves and also watch what is going on outside. How much do you want to spend? – Cat condos range in price from the low 50s to several hundred dollars. Knowing in advance how much you want to spend can save you a lot of time and frustration. Decide on a budget and look for the cat condos that fall into that range. You’ll have plenty to choose from. Since cats are active animals, cat condo manufacturers include a lot of their favorite activities in their designs. They will usually love cat condos that allow them to do the things they normally love like scratching, hiding, observing, sleeping, climbing and jumping. When you start searching for a cat condo, be sure to take your cats’ behavior and favorite activities into account so you will choose one that offers those things. Below we have outlined some of the more common activities that condos will have. Tunnels – Cats love to climb into things. You may notice that they will climb through bags, boxes and other tunnel like items. Cat condos with tunnels included provide your cat with the ability to hide, crawl and even sleep inside them. Scratching Posts – Scratching is by far one of the most commonplace activities for cats. They love to sharpen their claws and most cat condos have many posts that are covered in sisal rope. By giving your cat a regular and enjoyable place to scratch without reprimand, they are able to sharpen their claws and engage in this potentially destructive behavior without damaging anything. Hanging Toys – Manu cat condos have hanging toys such as balls, tiny animals, feathers and other toys that will move and catch the attention of your cat. In general, cats love to swat and bat at things that they see swinging around, especially when they are younger. If you choose a cat condo that doesn’t have these toys, you can always add them. The majority of older cats are not very interested in toys like this but while they are kittens and young adults, they will enjoy them a lot. Perches or Platforms – Cats usually love being above everything. This is one of the reasons they end up in trees or on your counters. Cat condos have several perches and platforms for this very reason. Not only can they sit up high and observe or sleep, they can also get some exercise by jumping from perch to perch. Cat “bedrooms” – A typical cat condo has one or more rooms within the condo that the cats can enter through holes or doorways. This is great for the cat that likes privacy when they sleep. Some of the larger cat condos can have as many as 4 separate rooms. Ramps and Levels – Some designs incorporate ramps from one level to another. This design is great for the older cat that may not be as adept at jumping. The different levels and ramps make navigating the cat condo possible even when the cat starts getting some age on them. Multiple levels are also optimum for multiple cat households because they don’t have to fight over spots, there room for all of them. Cat condos come in all shapes, sizes and colors. You can choose from really elaborate designs that resemble cat amusement parks or get a simpler design. Colors can be anything from neutrals like beige or white, to dark colors like chocolate brown and navy blue. If color makes a difference to you, look for cat condos that have color choices. Neutrals tend to work better in all types of décor, but if you have dark brown or navy in your color schemes, you may want to choose one that will really match. Cat condos are excellent for keeping your cats occupied and happy. A cat that has nothing to do will more than likely use your furniture, no matter how important, expensive or antique it may be for their activities including scratching. It is especially important to have a great cat condo or cat tree for your cats if they are strictly indoor cats since they don’t get the same climbing and playing opportunities that outdoor cats get. With the huge array of designs, sizes and activities available, you can choose a cat condo that is perfect for your cats and provide them with years’ worth of fun, privacy, exercise and happiness.